How long have you lived in Colônia? I’ve lived in Colônia since November 1st, 1990. I came from a hill in Praça Seca where there was a lot of violence. My cousins already lived here. When I got here you couldn’t build any more so I stayed living in my cousin’s house, then with my daughter. When did you start gardening organic fruit and vegetables? In 2000 the Environment Secretary ran the Guardião project that called for people to work cleaning the rivers of the city. I was unemployed and went to work on this project. 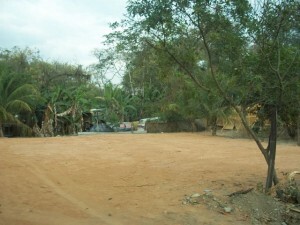 Every community where the project was had to have a vegetable garden, but after everything was planted the project was abandoned (by the State). I stayed with the garden and the Director of Colônia handed it over to me, saying I could build a house and live there looking after the garden. I built a house with two rooms myself. How did you develop the garden after that? I started planting and selling on the roadside and going around the community with a cart. 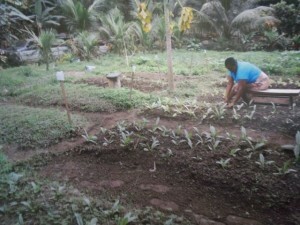 All the money I received I invested in the garden, rotating plants to improve the land. 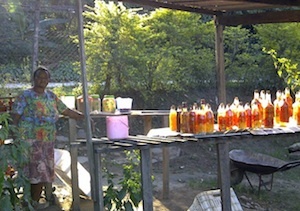 I sold vegetables, spices, conserves, pepper oil, homemade syrups, saplings, earning R$150-300 per week. I did lots of courses in medicinal plants, how to cultivate plants, seed research. Everything I learned I brought to the garden. I planted mango, lime, achiote, colorau [similar to paprika], yam, cinnamon and all types of banana. Schools would bring the children to learn about planting. Did the city authorities know about your vegetable garden? 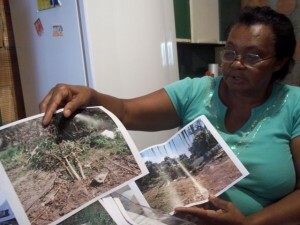 When the city authorities came into Colônia in 2009 [for upgrading and infrastructure works as part of the federal Growth Acceleration Program-PAC] they knew about the vegetable garden. The engineers would said “Wow, what a beautiful place!” and buy greens, pepper sauce and syrups. Everyone from the city authorities knew that I lived off that. When did you find out that the authorities planned to use the land and that you’d have to leave? A week before Rio+20 I was at home doing seedlings for the market when I first received notice that the city authorities were going to use the plot of land and that I was going to be summoned. I went straight to the Housing Secretariat where they told me I had the right to an assisted house purchase or social rent, and that they needed the land to make a garbage collection site. I asked ‘Why? There’s so much land there without anything. 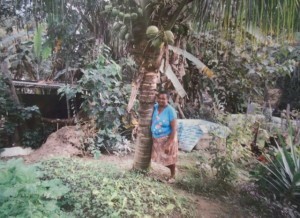 Why did they want that piece of land I live off of?’ She said they know, but the project is there and can’t be changed and that I had to find a house for R$32,000. I went everywhere and couldn’t find a house for R$32,000 anywhere. I went all around Jacarepaguá, Vargem Grande and even further. I only found houses for R$95,000, R$130,000. I went back and told them I couldn’t find anything for this amount but they told me I had to find something. There aren’t any more properties for this amount in Colônia ever since the city authorities came in. Everything’s gone up. At the beginning of July two engineers came and told me that they didn’t want to use the land anymore and I could relax. I stayed and stopped looking. 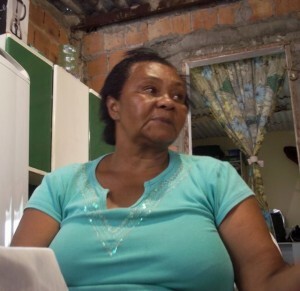 Then I saw a house for R$70,000 nearby and told the lady at the authorities about it, but since everyone was telling me that they weren’t going to use the land any more and I wouldn’t have to leave, I carried on. No one came to me until the end of July when a representative of the city authorities came to tell me that the owner had lowered her asking price and she would take the proposal to her boss. I didn’t understand anything. One moment I had to leave, the next I didn’t, the next I did. They summoned me to City Hall on July 31st. The house owner was there and the purchase had all been prepared. The sale went through and they said I’d stay [at the garden] until they’d done necessary work on the [new] house. Can you tell me about the day of the demolition? How did it happen? On Friday August 10th at 10pm I got home from church and found the owner of the purchased house there. She gave me the keys and said that I was to give it to the city authorities on Monday for them to do the work. The following morning at 8am I woke up to a machine in the garden. There were a lot of people, engineers from the city authorities. They didn’t knock asking to come in. They started pulling everything up and throwing it in the road. I went into shock. There were lots of plants that I was going to gather up slowly and move, but there wasn’t time to get anything. They dragged my things out. Neighbors came and argued with the engineers demanding to know why they were doing this. It was like a Shock Order [Rio’s agressive program to crack down on public disorder and small crime]. They started breaking all the plants. They took coconuts, removed and ate the palm hearts and fruits. They said the deadline had passed and that I had to leave then. I was so dizzy that I couldn’t stand up. I came to this house and it was dirty, full of garbage, clothes and wires hanging, a huge hole in the bathroom. I couldn’t do anything. I took a great blow. I had seeds I couldn’t recover, a stand, a chicken coop. They broke everything. I never expected to go through this. I’ve been to the city authorities twice. The Environment Secretariat saw the video and called me in to tell me there was an error but that they won’t argue with the Secretariat of Housing. I asked them, ‘who’s going to buy my bread and rice?’ He left the room and then came back and told me there’s nothing they can do. I cried the whole time. How am I going to start my life over? 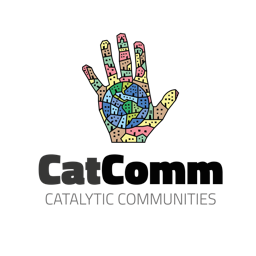 What they’re doing is ending people’s lives without assuming responsibility and leaving things any which way. They’ve left me here and took possession of the land while I have to find food. How can they go into a vegetable garden with all kinds of species planted and bring it to the ground? It has no value? It’s very difficult. I’m knocking on people’s doors asking for rice. This article was written by Erica Tapley, and published on September 24, 2012.